Chief Technologist, Bone Marrow Processing Lab NZBS. Tissue Typing Lab, NZ Blood Service. Chief Technologist, High Volume Lab. Clinical Charge Nurse Apheresis Service NZ Blood Service. Consultants at Otago District Health Board. The Bone Marrow Transplant (BMT) Coordinator prepares the planning list for each meeting and the Chair will write letters documenting the decisions made on newly referred patients. These are regarded as the minutes. The Committee deals with policy issues and principles of individual patient selection and management. New Zealand Blood Service staff. Only in urgent circumstances will decisions on patient selection and management be made outside of the HSCT Committee. In these circumstances, the Committee Chair and referring Consultant will consult other Committee members before reaching a decision. All patients referred for consideration of HSCT will be reviewed by the Christchurch Hospital Haematopoietic Stem Cell Transplant Committee, which meets every two weeks on Mondays at 1-2 pm in the BMTU Meeting Room. Referral letters should be emailed to HSCTcommittee@cdhb.health.nz or posted to Dr Butler, HSCT Committee Chair, Christchurch Hospital, Haematology Department, PO Box 4710, Christchurch 8140. Attach supporting documentation where necessary. Send to the Committee Chair in time to circulate to other Committee members prior to the meeting, in general by the previous Wednesday. Diagnosis and current disease status, i.e. relapse, primary refractory, remission. Disease risk score, e.g. NHL (IPI, FLIPI, MIPI), MDS (WHO), AML (cytogenetics, PCR). Previous chemotherapy and any adverse reactions. Current performance status, e.g. ECOG, WHO or Karnofsky. Relevant imaging, e.g. CT scans to be transferred by PACS to Christchurch. Relevant histopathology, e.g. diagnostic and relapse biopsies. Relevant supporting material, e.g. guidelines, reviews, trial data. The Committee will evaluate each referral in relation to the current indications for SCT procedures, and will reach its decision by consensus, taking into account individual patient factors, priority with regard to other patients, and resource availability. No patient should be promised a SCT procedure without prior approval from the Committee. In general, transplantation is recommended only for those patients in whom the chance of survival post SCT is likely to be in the order of 20% or more at 2 years but considerable discussion is given to individual circumstances. The rapid advance in many aspects, especially technological, of SCT has led to an increase in the number of transplants performed and a proliferation of centres performing them. There is some variability in procedures and standards between different transplant centres. In view of the risks and costs associated with stem cell transplants, legitimate concerns have been raised about the safety and quality of transplant procedures carried out within individual centres. Measures to accredit transplant centres on a more formal basis to ensure compliance with international guidelines are currently underway. The clinical service at Christchurch Hospital is registered with the International Bone Marrow Transplant Registry and is subject to on-site audit visits. The Unit is also registered with the NZBMDR and Australian Bone Marrow Donor Registry for involvement with unrelated donor transplants. 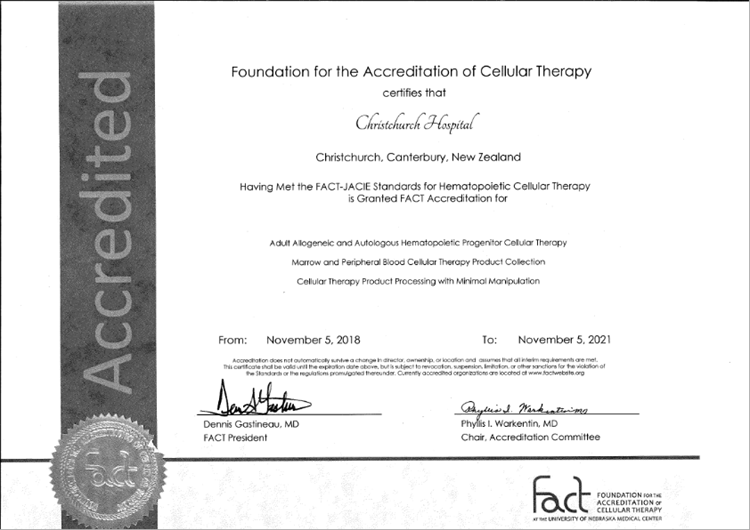 The laboratory service for processing and manipulation of haematopoietic stem cells (Canterbury Health Laboratories and the New Zealand Blood Service) is accredited by International Accreditation New Zealand (IANZ) and licensed following annual audit by the New Zealand Ministry of Health (MEDSAFE). The first FACT-Quality Coordinator, Meghan Heaphy, was appointed in September 2012. FACT accreditation was received on 5th November 2015. Haematologists and registrars are given Honorary Lecturer status by the UOC and eligible for E-journal access.